Lost In The Mix is available from online music stores: iTunes (US, Mexico, Canada, UK, EU, Australia/NZ and Japan), Myspace Music, Amazon mp3, and Rhapsody. The very first thing that struck me as I began working on songs was just how very difficult it was. A good beat and a good sound was easy, but those two elements alone don’t make a good song. Good dance music is both energetic and engaging. Bad dance music is boring and monotonous. I had thought this project was possible because I’d done a dance remix of “The Final” on my Breakfast With The Blades EP. It was challenging, but the challenge there was not to completely desecrate a good song. 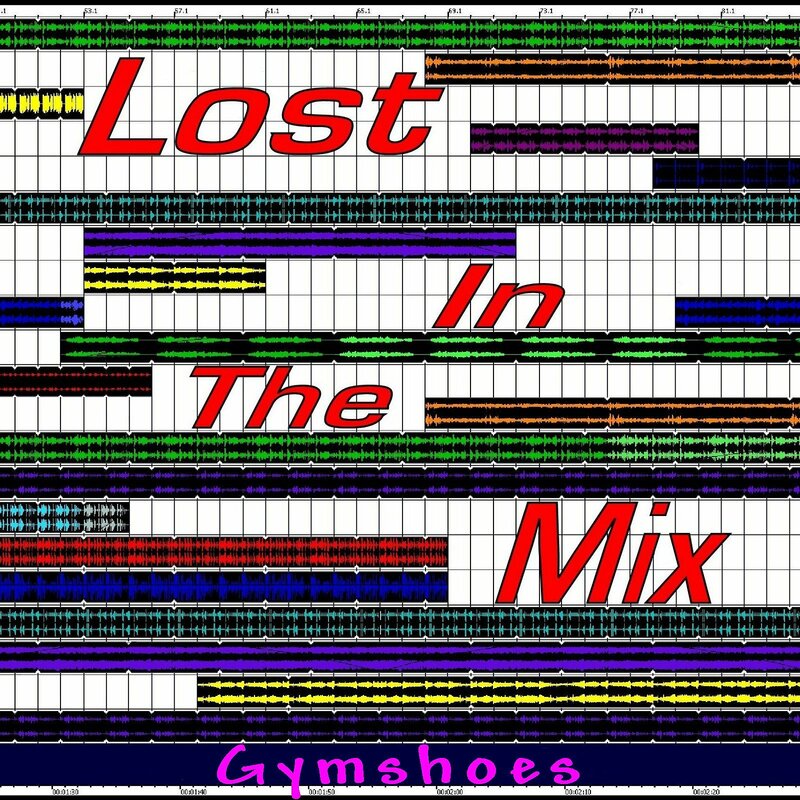 The challenge with the Lost In The Mix album was to create dance music from scratch. I succeeded and I failed. I succeeded in making some good dance cuts, but I failed in making an “electronic dance album”. Why? “Life is what happens while you are making other plans,” as the saying goes. In the fall of 2003 my best friend’s mother had another bout with cancer. They all spent a couple of weeks at the hospital. I did what I could; I made a disk of music. I thought some nice soothing ambient tracks would be just the thing, so I quickly put together some material finally burning the tracks, along with a couple of the dance tracks, on a disk. Now I had not one, but two albums started…one ambient, one dance…or did I? Oddly enough half the ambient musical sketches had rhythmic elements in them. (Perhaps not so odd when you consider I was listening to Bill Laswell’s Disengage a lot at the time.) Gradually some of the ambient material migrated into the Lost In The Mix project. I reinforced existing rhythms, but I didn’t goose up the tempo on these songs. They retained the laid back sometimes dreamy feel of the original ambient material. You can’t dance to them, but you can’t sleep to them either. These three tracks changed the balance and feel of the whole album, but they belong here because…well, that’s life. Music reflects the ebb and flow of life. The ambient material that was eventually developed into “Jellyfish In Captivity”, “Imaginary Islands”, and “Neon Night Light” was never about hospitals or family crisis; they were about other things…about wonderful places I could see in my mind’s eye. The dance tracks are also about wonderful, joyful places in my mind’s eye. I guess that’s what binds all these songs into an album. Thematic joy. Joy in the face of everything. Below are some notes on the individual songs. I hope you enjoy listening to this album as much as I enjoyed creating it. 1.Technodog This is very urban, dance, and for me, quite experimental. A friend of mine was hurt badly by someone she loved. The situation was too awful for “happy” songs and dark depressing music, while wholly appropriate for the situation, would not do anything to lift her spirits. So I sat down and did this for her. Being a dog-lover also, I thought she would appreciate the theme. Dogs are incapable of betrayal. 2. Chocolate Umbrella Composed through a very rainy spell in the spring 2004, I used a number of liquidly synths, which make me think of water, torrential rain, and fat raindrops splashing everywhere. I love rainy days so it’s no real surprise that I composed an uptempo song to accompany them. Where does the title come from? During this time I went to see an exhibit on the history of chocolate at the Museum of Natural Science. It was, of course, another rainy day. I bought an umbrella covered with a photo of chocolates at the gift shop and consumed some very fine Belgian chocolate. Eating chocolate, beneath my chocolate umbrella, in the glorious spring rain. 4. Zen Garden Groove A hidden garden, neglected, but thriving despite not getting enough sunshine. In the middle of the city, bordered by a couple of live oaks and old buildings earmarked for razing or renovation. Not a meditation garden of stones, nor a formal Japanese garden, this was wilder–with herbs and other things. It looked like it had been sort of a catch-all place for various plants, though the area was very formal. The rigidity of the design combined with the unkempt rampant vigor of plants obviously no longer cared for was striking. I suspect the area has been paved by now and that this song is all that remains to convey the altogether wonderful sensation of being in that place. 5. Jellyfish In Captivity This track always seemed aquatic to me. The more I worked on it, the more my mind cast around for appropriate metaphors. When my brother-in-law, sister-in-law and niece returned from a trip to Monterey, California they told me about the great aquarium—-which had jellyfish! I marveled aloud at the concept of “jellyfish in captivity” because growing up on the coast I’d only seen them in the wild. Jellyfish and man-o-wars were the real terrors of my youth—not the ubiquitous “Jaws”. In the fall 2003 I had an opportunity to see jellyfish in captivity myself. They were in a dark tank, lit by a black light, glowing and pulsing in the tank. I had my song title! I have, by the way, seen jellyfish in the wild glowing from bioluminescence…one night in the summer off the Gulf coast (Mississippi, I think) there were hundreds of them, in the water, all over the beach…you could hardly walk for them, glowing eerily. It was both beautiful and scary. I’m glad to have seen them, but I prefer jellyfish in captivity. 6. Imaginary Islands This began as an ambient track, but it didn’t seem to work very well. I set it aside and returned to it with fresh ears some months later. It occurred to me that the song could benefit greatly from adding hand drums. Sometimes it’s good to step away from something, not just to hear it afresh, but to allow oneself to not force a song arbitrarily into a category it doesn’t want to go into. Ultimately this song wanted to be something different from my original intention when I began working on it. It could never be fully realized as an ambient track the way it can now. It still has a laid-back “island” feel. The addition of the slow rhythm tracks made it feel even more tropical. Like no island I know, this piece became my imaginary island. 7. Mid-Summer Night’s Dance Yes, this title is a Shakespearean allusion, though this doesn’t sound much like it would go with the fairy scenes of the play. Nevertheless, there is a summer’s evening feel to it, friendly, fun and a bit mysterious. It evokes the twilight evenings of my childhood. (With a beat!) This was the first track I composed for this album. 8. Uptown Shimmy There’s something about this beat that makes me want to shimmy, not just dance, but shimmy. And yes, that is a vintage Hammond B3 organ you hear in the background. 10. Neon Night Light As I worked on this song I was continually reminded of somewhere I’d been, some moment that I couldn’t quite pull up in my mind. The feeling evoked by this piece is very strong. Night in the city, neon lights, warm summer breeze, a distant half-heard phrase by a saxophone wafting out of a doorway. I can see it all, hear it, feel it clearly enough to know that I haven’t created a soundscape for a single place or moment in the past, but rather what I see in my mind’s eye is an amalgamation of several moments in different cities, the soft glow of neon, friendly and warm, the energy of the city at night. Neon like a night light…music in the air…a feeling of joy rising like heat from the pavement.